2018 is a new year. Moreover, January is the start of predictions for what will happen in 2018. Silver forecasts for 2018 have started to come - and it is interesting what they are saying, but more importantly what the forecasts are not saying for silver. Bitcoin was all the rave in the investment community last year. WHAT WAS ALL THE ATTENTION IN 2017? Much of the news in 2017 was focused on bitcoin, and it seemed like you couldn’t turn on anything without some article on bitcoin, a video, or meet people talking about bitcoin. The top Global News events in 2017 were not surprisingly related to weather, violence, a giraffe and bitcoin made #2. I think one of the most asked questions in investing in 2017, “So what do you think of Bitcoin?”. It was almost a guaranteed question that was asked. Bitcoin is in a bear market territory! It is down more than 20% from its high…and it needs to break above $16,000, or go above 80% from its high to signal the bear market is over. Another generation has repeated what past generations have done before them, but this time is different with bitcoin. Rinse and repeat for the next generation, after them. Just like the tech dot-com bubble in 2000, and everyone hoped for the stars, and relied on non-revenue earning websites. Now these new lessons influence how they think about their next investment. These speculators will go back to finding things that are easy to understand and they can explain. I had a conversation recently with an analyst…and I mentioned the word “gold”. There was some intrigue, but not much. Then I mentioned the word “copper” …a bit more interest because the economy is doing well. How about “battery metals or energy metals like cobalt or lithium” …EYES LIGHTS UP….and silver…nothing, no reaction, he wasn’t sure really what to say…we are on to something. Let’s keep digging. Silver closed 2017 at 16.82/oz. and has really remained flat to start the year, closing at $17.09/oz. on Friday, January 18. It is still early in the year, 11 ½ more months of trading to go. A lot can happen. Looking at the sell-side analyst estimates, for the most part they are only slightly bullish on silver. TD Securities is definitely an outlier. However, analysts are not paying much attention to the silver price because their clients (producers, hedge funds, etc., manufacturers) are not paying too much attention, yet. The median upside target among these 5 firms is only 11% upside, putting silver at a price target of $18.67, or about 9% to go, from Friday’s close. Nothing to see here folks, keep moving along. This begs the question: Is there something that people are missing? When you look at past historical commodity booms from the 2000’s and 1970’s, was it just oil and gold going up? No. You saw a majority of the commodities go up because there was a rotation from equities into hard assets. The main benchmark that is the source is the S&P GSCI Index. And what is inside the S&P GSCI Index? 18 different commodities focused on Energy (Crude Oil And Natural Gas), Agriculture crops like wheat and soybean, livestock, base metals, and precious metals. All boats rise together in the commodity boom as investors buy the basket of commodities. Lesson to learn: Pick the commodity you know well. Silver is one of those that I know. Pick the one that you know the best, you’ll be able to find bigger rewards during the boom. WHAT HAPPENED TO THE EQUITIES DURING THE ROTATION? Remember the NASDAQ and S&P500 really didn’t do anything for 10 years (i.e. after the tech bubble burst in 2000, and broader equities underperformed hard assets like commodities. Commodity countries boomed, like Australia, Canada, Chile and Russia. Silver accounts for a small portion of commodity trading, so it isn’t get much attention right now, particularly when other commodities like marijuana crops and energy metals are getting all the attention. That’s fine. It’s good for those to accumulate more. But slowly and surely silver is moving up. Silver was up 17.5% in 2016, and +3.6% in 2017. History tells us, this is normal. With all the attention all Bitcoin now collapsing - and since peaking in December, and energy metals now all the rage as the demand increases from electric vehicles because of government and company announcements, they are focusing on EV’s. No one is talking about the increasing demand coming from the increasing usage of silver in Internet of Things. This trend is kind of big deal, when you have refrigerators, stoves and microwaves all getting hooked up to the internet, ergo you need silver. 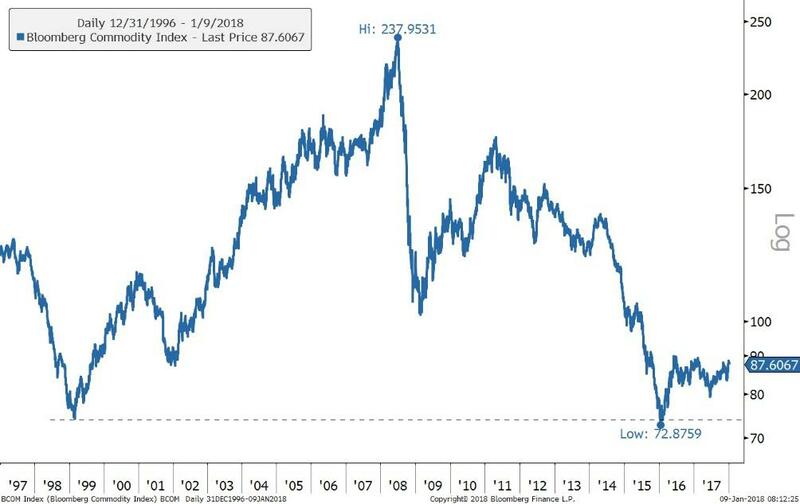 If you apply the longer-term contrarian view, silver may represent incredible long-term upside. However, no one is putting much value to it. Just look at the analyst estimates we mentioned earlier. WHAT IS THE POTENTIAL FOR SILVER? For those investing in the silver sector, it’s upside can be quite profitable once it gets moving. Professional investors want the risks of downside low and the upside – high. It is a benefit to those reading this today, you have an opportunity to do the work now to identify the silver investment that is of interest to you. Use the opportunity that everyone is focused on bitcoin, energy metals and technology to your advantage. 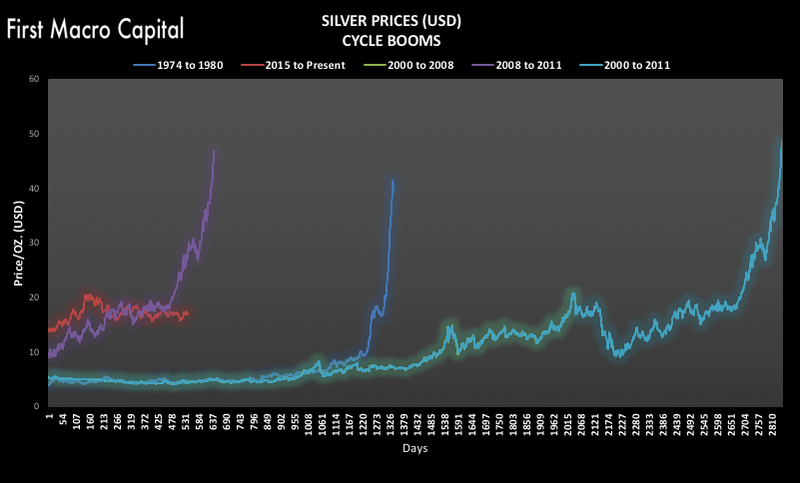 THE SILVER PRICE BOOM takes place in the final 10-20% of the bull run. This is when you start to see the price of the asset go parabolic…when the analysts’ estimates start to double or triple from the current price. Silver is not there yet. Analysts are only expecting single to low-digit moves…before the price starts to go parabolic, from 2X and 3X times price appreciation from the bottom, before the average investor starts to get excited. Since 2015 Silver bottomed at $13.43, it is only up 28%. Moreover, it has gone as high as 54%...but subsequently came back down. We could see a pullback silver in the near-term if the economy slows down. Silver did this in 2000. It should be remembered that all assets, particularly broader equities, cyclically rotate into commodities. This is part of the process. We shall see how the ISM’s hold out in 2018. Take a longer-term view, 2-3 years, and you must expect it won’t go straight up. Looking at the past silver price booms, we can see that a majority of the move takes place in the final 10-20%or the entire rally period. Silver slowly creeped up as smart money was in early, which made explosive moves higher. Use the lessons of bitcoin to your advantage. In the beginning not much attention was given to Bitcoin by the general media…as the average retail investor including institutional investors tend to be slower moving. Sound like Silver? Yes and Yes. We could see some turbulence if the economy slows, but we are in a cyclical rotation out of technology into hard assets. You know you are near the peak when politicians are being negative in a sector because of all the profits have already been made. Technology is that sector today. Oil and gas were before that…and in mining before that when governments were trying to take over mines and ratchet up the royalties. A lot of sell-side analysts focus on NAV/share when they are comparing mining stocks. This includes gold stocks, silver stocks…and just about anything that’s involved. The challenge when you pitch NAV/share to a portfolio manager that gets scored how well they are doing on a weekly, and monthly basis, NAV/share doesn’t help on a monthly or quarterly basis too. Portfolio managers want factors that will make the stock become worth more in the future. Assuming you don’t know what, the silver price will be tomorrow, what will be the 2-3 factors that will make the share price be worth 50-200%? And how long will it take to get there? Finally, what are 2-3 factors that will make the share price go down by 20-30%? Use the value chain approach to identify a hidden value that a company has. You can do this now when no one is paying attention to silver stocks. Unless you are buying physical silver, there are different rewards and risks to consider. Your timing will be wrong, 100%. Look at your past investments, how early or late you were. 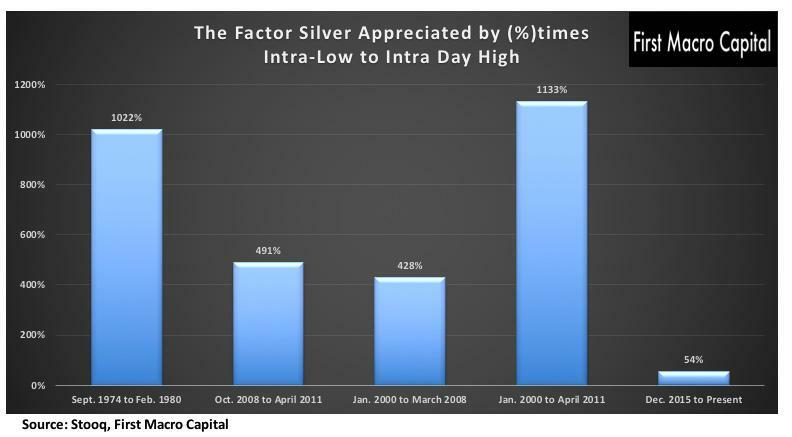 Apply this to you silver investment. Look at the bankers who help finance deals…asset managers that have silver exposure. Take note: Silver mining stocks, silver explorers and developers are not the only way to invest in silver. 2017 was the year of Bitcoin and weather. And 2018 is an opportunity for silver investors to start to pay attention to silver investments because no one is paying attention to it. You are either ready or you not. Focus on the fundamentals of the silver investments you make and make sure they match your time horizon…because it could take it longer than you expect. There will ups and downs on the way higher, it is never straight up. Paul Farrugia, BCom. Paul is the President & CEO of First Macro Capital. He helps his readers identify gold & silver mining stocks, including energy metals stocks that you can hold for the long-term. He provides a checklist to find winning mining producer stocks. This document is not intended to be investment advice and does not offer to provide investment advice or sell or solicit any offer to buy securities. First Macro Capital is owned by Farrugia and Company. First Macro Capital nor Farrugia and Company do not give any advice or make any representations through this document as to whether any security or investment is suitable to you or will be profitable. The discussion contained herein reflects Farrugia and Company’s opinion only. Farrugia and Company believes that the information on which this document is based is reliable, but Farrugia and Company does not guarantee its accuracy. Farrugia and Company is under no obligation to correct or update this document. Neither Farrugia and Company nor any of its officers, employees or agents will be liable or responsible for any loss or damage that you may incur from any cause relating to your use of these materials, whether or not the circumstances giving rise to such cause may have been within Farrugia and Company’s or any other such person’s control. In no event will Farrugia and Company or any other person be liable to you for any direct, special, indirect, consequential, incidental damages or any other damages of any kind even if such person understands that these damages might occur.